Panasonic Eliminates Barriers To Network Color Printing. The Ultimate Network Color Laser Printer. Fast, efficient, professional quality color, that's the laser advantage. Now Panasonic's making it easier for everyone to experience the quality and convenience of color laser printing with the KX-CL400. Ideal for small and mid-size businesses, this affordable low maintenance color laser printer not only offers true 1200 x 1200 dpi print resolution and a versatile network capability, it's among the world's first printer that's ID-certified for the new-generation IPv6 network protocol. The KX-CL400 is compact, affordable, and designed to be low-maintenance. Panasonic's one pass technology is optimized to deliver high quality color printing up to 4 times faster than other conventional color printers' up to 18ppm in color and Black and White. Automatic Duplex for efficient double-sided printing. 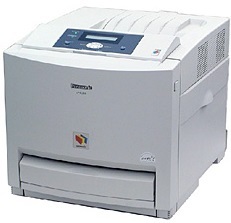 - This printer is designed to accommodate an optional automatic duplex unit (KX-CLAD1), enabling effortless double-sided printing. Cost effective and speedy, double-sided prints are output at an incredible up to 18ppm in color and Black and White. With Panasonic's advanced technology, the printer's speed remains the same even when printing two-sided documents. Set your printer to maximum dpi setting to obtain the best image quality. Be sure that you are printing on the 'right' side of the paper - that is - the coated side.